Enhancing life palettes. Empowering individual's be-YOU-ty. Certified Lifestyle Enthusiast Lucretia D'Coleman Clark, aka as “Livacious Lu” is known for her audaciously artsy and captivating personality. 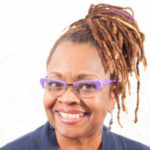 As a SPEAKER, COACH, ARTIST, and AUTHOR, Lucretia teaches Women of Color and how to unify and enhance their 12 life areas empowering them to show up authentically and vibrantly in all aspects of their life. As Founder and CEO of Jameri Enterprises LLC, Lucretia’s commitment to providing incomparable services and products designed to cultivate self-care, self-growth, and self-expression is undeniable. Lucretia holds a Bachelor of Science degree in Business Administration from Gwynedd Mercy University. She’s certified as an Integrative Wellness Coach from the Institute of Integrative Nutrition where she’s trained in more than 100 lifestyle theories and coaching methods. Lucretia volunteers as Board Member of YWCA Tri-County Area and member of National Association of Professional Women. She also supports TriiCounty Area Chamber of Commerce, and TriCounty Community Network.